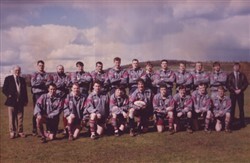 Olney RFC 1st XV, Bucks Cup Runners Up 1994-95, colour team line-up photograph season 1994-1995. Standing: L. Fairey (President), I. Bennett, W. Boulton, B. Elderton, T. Salsbury, O. Smith, J. McLoughlin, J. Page, B. Brock, J. Holmes, C. Day, T. Stanbridge, T. Carter (Coach). Kneeling: D. Baseley, D. Crafter, J. Fossey, A. Mynard, A. Wilcox (Captain), A. Fitzgerald, D. Hurley, A. Doyle, C. Williams.